The Department of Public Instruction has directed all private aided and unaided primary, secondary and high schools to begin its admission process from April 10. Schools should collect only Rs. 5 for an application form and Rs. 20 for prospectus. Aided schools with classes between 1 and 5 have been barred from collecting tuition fee, development fee and the like. 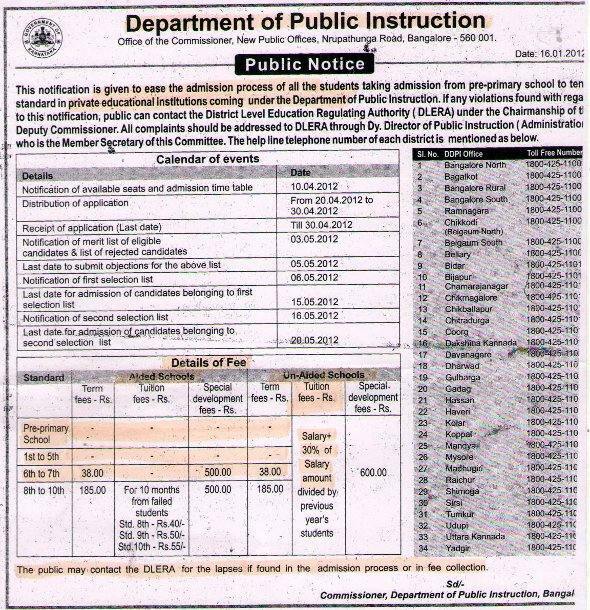 As special development fee, these schools could collect a maximum of Rs. 600. The official has warned that stern legal action would be initiated against school authorities who collect more than the prescribed fee. April 10 – display along with details of the number of seats available in each class. Parents who are asked to pay more could register a complaint with the department or complaints could also be registered through toll-free number 1800-425-11015. The Karnataka government has fixed a 30 per cent profit margin for private schools. Helo…..Year by year shaikh Central school is demanding More money to pay Earllier in advance….We the common people can’t pay a huge advance fess..and the management is refusing to help us…PLZZ suggest me ?? Please suggest me a few good nursery schools as my kid is 3 years and 6 months by April this year, and am planning her education to be uninterrupted (from LKG to 10th ) in one school itself rather than in a bits and pieces manner. see for schools close to ur place of living, as we arent aware of that commenting here wwould be not be so advisable. Private schools take heavy donations in form of building fund/development fund. But they don’t give any receipt for that. And parents feel proud for donating fund, as in their kids enjoy certain facilities in school. They feel exposing donation racket would ruin their kids life. So Govt’s donation rule would rather be another one like helmet rule…. Well in some cases schools run by politicians and missionaries surely not comply this notice, they work in thier own vested interest, a common man will still continue to suffer, but it is a good move by govt though, will it be implemented strictly is million dolalr question? ?